Researchers are now gathered for the Perdigão field campaign, an effort to study wind flow physics at scales down to tens of meters. The effort should help engineers harness wind energy in Europe. 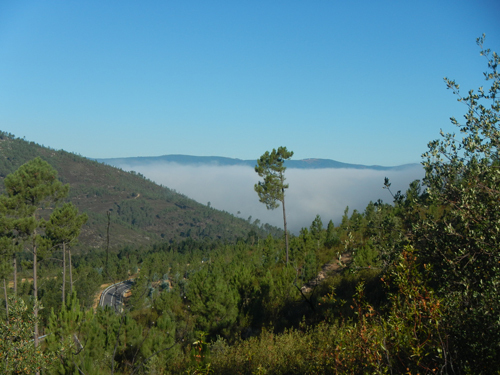 Right now, dozens of scientists from the European Union and the United States have converged on central Portugal’s picturesque Vale Cobrão, a valley nestled within a double ridge (Figure 1). They have gathered to conduct a field campaign designed to understand wind energy physics and improve short-time predictability of airflow in mountainous terrain. Researchers also hope to create a new digital wind atlas of Europe. Drawing its name from the town nearest the project location, the field campaign has been dubbed Perdigão, which means partridge in Portuguese. One of five similar campaigns that spread across Europe, Perdigão aims to provide the wind energy sector tools to map wind vectors at spatial resolutions on the order of tens to hundreds of meters and temporal resolutions from seconds to hours (the so-called microscales). With these tools, researchers also hope to extrapolate observations and create a new digital wind atlas of Europe. 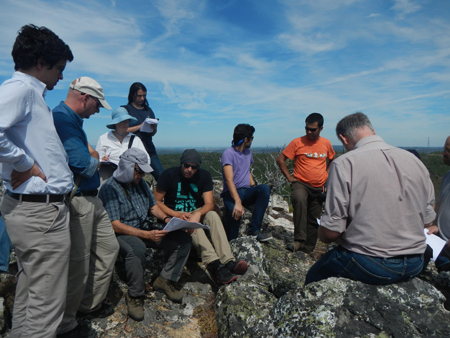 To help accomplish these goals, researchers are monitoring the Vale Cobrão for 45 days, will combine their data with longer-term observations of the region, and then will use the complete set of observations to create new models or refine existing ones. Once validated, the models will map wind resources at resolutions that the energy sector needs so that it can more efficiently determine where to locate industrial windmills and predict wind strength, duration, and direction hours in advance. Until recently, practical applications like routine weather prediction, air pollution, aviation, and Alpine warfare drove mountain meteorology research. For these purposes, wind prediction at mesoscale resolution (on the order of a few kilometers in space and hours to days in time) is generally sufficient. Consequently, there have been a host of field and modeling studies at these scales [Fernando et al., 2015]. Now, however, the rapid increase in wind energy production and threats from airborne contamination demand improved predictive accuracy at microscales. For example, gustiness is an unsteady phenomenon due to instabilities and turbulence arising at microscales and is a major factor determining mechanical longevity of wind turbines. Another challenge is the volatility, or rapid variability, of winds [Giebel et al., 2011], particularly on two timescale windows, one determining turbine control (milliseconds to tens of seconds) and the other related to integration of turbine power to the electric grid (minutes to weeks). Scales of 1 hour or less are not usually monitored in practice. This lack of monitoring contributes, in some cases, to uncertainties in wind predictions that exceed 100%. Detailed observations on this scale are rare, and Perdigão is designed to fill this niche. The project is particularly important in view of the European Union’s vision of increasing its wind energy share of total energy consumption from the current 16.5% to 25% by 2030. The United States aspires to increase its share to 20% by 2030, up from the current 6%. Perdigão will survey a swath of the Cobrão valley approximately 6 kilometers long and 2 kilometers wide. Depending on where one is in this valley, wind speeds at 10 meters above ground typically can range from 1 to 5 meters per second. At 200 meters above the ridgetop, wind can flow as fast as 10–15 meters per second. An important design consideration is to collect a rich set of flow and turbulence data particularly relevant for positioning wind turbines. Vertically, instruments pointed or ascended upward will extend measurements to tens of kilometers, up into the stratosphere, with dense measurements up to several kilometers above the ridge height (which in itself is about 500 meters above the plain below). An important design consideration is to collect a rich set of flow and turbulence data extending from the surface to 300 meters above ground level, particularly relevant for positioning wind turbines. A pilot experiment conducted by the European Union (EU) group in May–June 2015 with three lidar systems scanning the valley provided critical insights for designing the Perdigão campaign. The results guided the instrument placement to best capture diurnal flow variability, thermal circulation, turbine wake, and topographic effects. Perdigão’s instrument array is uniquely dense (Figure 2) and includes 54 flux towers with heights of 10–100 meters that hold sonic anemometers for measuring mean flow, turbulence, and fluxes; thermistor arrays; LiCORs® to measure carbon dioxide and water vapor; and radiometers to measure incoming, outgoing, and net radiation. Augmenting the flux towers are state-of-the-art remote sensors to measure flow (sound detection and ranging systems, or sodars; lidars; and radar wind profilers) as well as temperature and humidity (microwave radiometers, radio acoustic sounding systems, atmospheric emitted radiation interferometers, differential absorption (water vapor) lidar, and ceilometers). Other platforms such as tethered lifting systems that help make profiles of fine-scale turbulence, microbarographs and nanobarographs that record pressure and acoustic propagation, and radiosondes that help capture vertical profiles of wind vectors, temperature, and relative humidity are also used. The Perdigão deployment promises a leap forward from the early microscale experiments conducted in the late 1970s, such as the landmark Askervein (Scotland) experiment. Askervein focused on flow past a single hill, and the data set is still used extensively. Building on the contributions of Askervein, the double-ridge study at Perdigão will deploy 67 sonic anemometers, compared with 28 at Askervein. Even more significant, Perdigão capitalizes on recent advances in remote sensing to probe the lower atmosphere in innovative ways. The campaign’s lidar coverage in particular is unparalleled, with 30 scanning and profiling units operating to map the valley atmosphere in coordinated or autonomous modes. In a major leap from previous field studies, the average and turbulent velocity fields will be measured by six triumvirates of scanning Doppler lidars at 25- to 75-meter resolution. 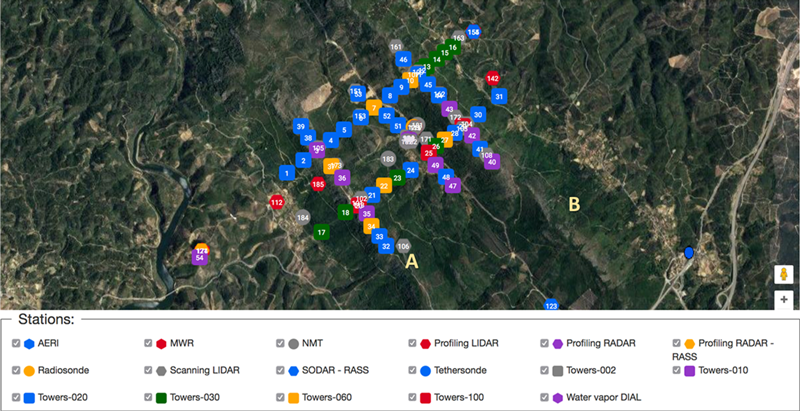 The pooled, coordinated measurement and modeling capabilities of investigators from the EU and the United States will provide a holistic view of microscale processes in complex terrain. The current Perdigão effort is cofunded by ERANET+, an EU funding instrument, and by the U.S. National Science Foundation’s Physical and Dynamical Meteorology Program. The EU program (€13 million) spans 2014–2019 and includes five field programs in Europe, with Perdigão being the most comprehensive. The U.S. counterpart ($3.4 million) will focus only on the entire Perdigão project, from experimental setup to observations to data analysis, during 2016–2019. Perdigão’s extended observation period with limited instrument deployment started in December 2016, and an intense operation period with “all systems go” started on 1 May and will continue through 15 June 2017. Vale Cobrão offers unique scientific features. The ridges are approximately parallel, and airflow is predominantly perpendicular to ridges. Frequent flow reversals also occur. The reversals of flow allow scientists to capture multiple scenarios involving topography in a single observation period. The valley’s size is equivalent to one grid box for a mesoscale model, so the researchers hope to study how a mesoscale model can be downscaled to microscales, ensuring adequate spin-up of the microscale model congruent with the coarser mesoscale model. The campaign site experiences significant seasonal variability, as recorded over several years by a meteorological station on a ridge. Deformities such as canyons and ridge gaps will allow researchers to study how inhomogeneities in topography influence wind patterns. Plus, repeated tessellations of land use (e.g., farms and managed forests scattered throughout the area) will allow researchers to examine microcirculation: the wind’s fine-scale relationships to surface roughness, temperature variations, and other factors. The site also has one existing full-scale windmill, allowing researchers to study wind features in the windmill turbine’s wake without confounding interference from other turbines’ wakes encountered in typical wind farms. In all, Vale Cobrão is a dream observatory for modelers and observers alike. The Perdigão project is a giant step forward in gathering massive data sets in complex terrain. The Perdigão project is a giant step forward in gathering massive data sets in complex terrain at microscale using cutting-edge measurement platforms, probing down to a spatial resolution of meters and timescales of deciseconds. The outcomes will include improved wind energy and microscale physics in complex terrain and new model-usable parameterizations. Researchers hope eventually to scale up models to help develop wind maps spanning all of Europe with spatial resolution of tens to hundreds of meters. The researchers hope that the Perdigão field campaign will lead to a “gold standard” data set for high-fidelity microscale simulations and forecasting as well as process studies. The broad scientific community will be able to join the data analysis after quality assurance and quality control are completed, which is expected to be in about 1 year. For more information, see the project’s website. Perdigão’s EU group is headed by Jakob Mann of the Technical University of Denmark, with Jose Palma of University of Porto as the Portuguese lead principal investigator. Other European participants include DLR (Germany), INEGI (Portugal), and the Portuguese Meteorological Service (IPMA). The U.S. group includes the University of Notre Dame (lead); the University of Colorado Boulder (colead); Cornell University; the University of Oklahoma; the University of California, Berkeley; and the Army Research Laboratory. The National Center for Atmospheric Research’s (NCAR) Earth Observing Laboratory (EOL) is providing logistical, scientific, and data support as well as an array of measurement equipment. We thank the 50+ scientists, students, and technical staff who have committed to the field campaign, along with generous support from the area municipalities and landowners. Fernando, H. J. S., at al. (2015), The MATERHORN: Unraveling the intricacies of mountain weather, Bull. Am. Meteorol. Soc., 96(11), 1945–1967, https://doi.org/10.1175/BAMS-D-13-00131.1. Giebel, G., et al. (2011), The state of the art in short-term prediction of wind power: A literature overview, 2nd ed., technical report, 36 pp., ANEMOS.plus, ANEMOS Consortium, https://doi.org/10.13140/RG.2.1.2581.4485. —Harindra J. S. Fernando (email: [email protected]), University of Notre Dame, Notre Dame, Ind. 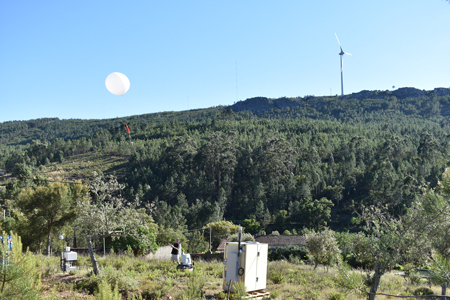 ; Julie K. Lundquist, University of Colorado Boulder; and Steven Oncley, National Center for Atmospheric Research, Boulder, Colo.
Citation: Fernando, H. J. S., J. K. Lundquist, and S. Oncley (2017), Monitoring wind in Portugal’s mountains down to microscales, Eos, 98, https://doi.org/10.1029/2017EO074745. Published on 31 May 2017.